We’re in New York City today, working on our little studio, and enjoying all the Spring beauty. A walk around the block here opens up a mini-world of wonders. Everything in Greenwich Village is squeezed and sliced into surprising spaces. History and new life are on every corner. 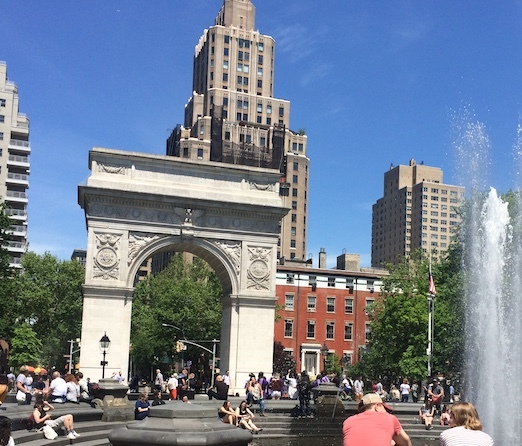 The park itself is beautiful right now, in full bloom, and with New York University students spread out all over the grass. The squirrels here are so fat, they only come up to you and beg if you have macarons to offer. 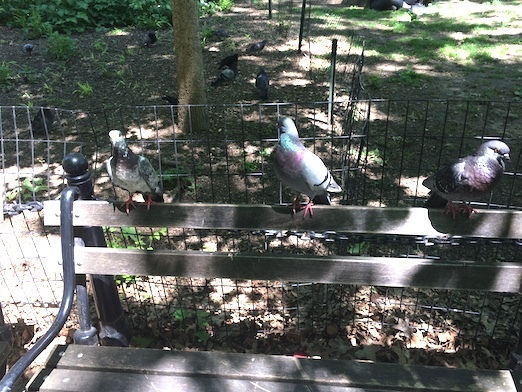 I’m not sure this is a “highlight” pic, but I loved these three pigeons posing smartly on a bench. Fat and sassy. There’s plenty of nature’s beauty in the heart of a city. 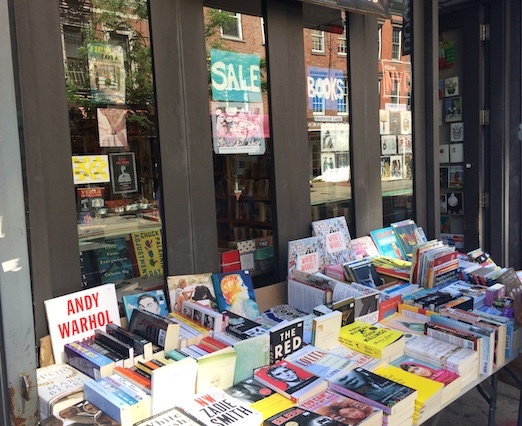 A bookstore right on the sidewalk. That’s irresistible. Literally – I can’t walk past a table of books without a browse. You thought I might forget the shopping, but no! 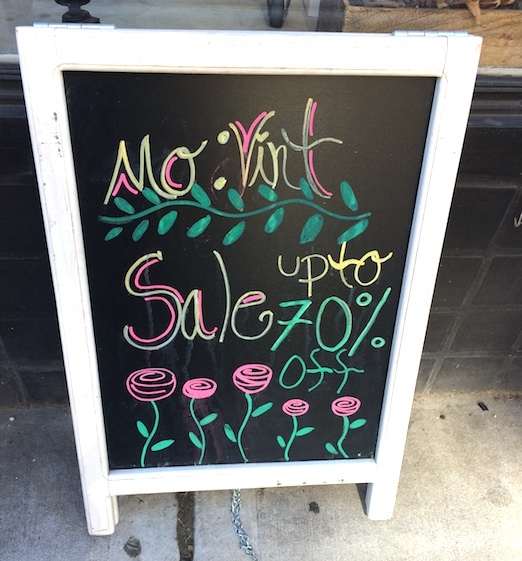 I found this new-to-me vintage shop today, Mo:Vint. Nice stuff, and the sales were tempting. 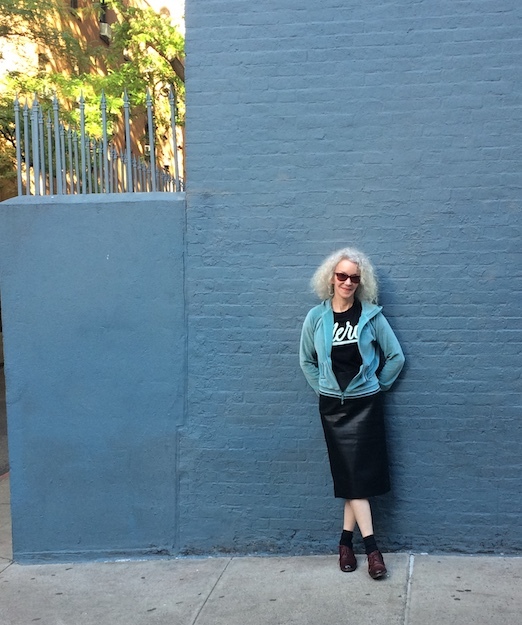 I had to end my tour at the Blue Wall on Minetta Lane. I’m wearing a newly thrifted pleather skirt – I never thought I’d like one, but it’s so comfortable, and practical: the dropped french fries slide right off. I have a cold, so my paleness is even more pronounced today. Slap some lipstick on, woman! Ahhh, Spring in New York! Thanks for sharing photos of one of my favourite spots to people watch. Ahhhhhh, NYC in Springtime! Wonderful! Wish I were there with you! By the way, who did the sketch? How totally fun to be in the center of everything like this, Patti!! And I had to laugh at the great aspect of these kinds of skirts—-I always say that the kitty hair doesn’t cling to them too!! Pigeons are soooooo sassy!!! Love the pleather skirt!!! I loved joining you for a stroll around the ‘hood, I’d be right in that bookshop, too. Ha ha! Gotta love a skirt where the french fries slide right off. You should be enjoying some brilliant weather down there right now. Lets hope we are as lucky in Raincouver.